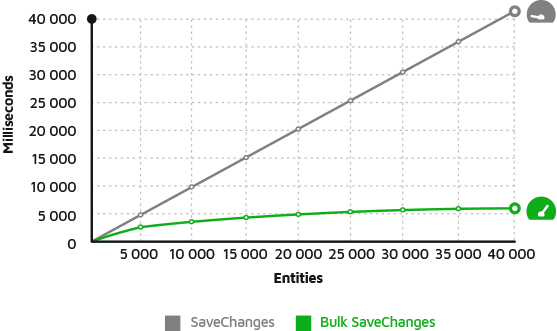 When you want to insert hundreds, thousands, or millions of entities using SaveChanges() method, you will notice that your application performance is INSANELY slow. The SaveChanges() requires one database round-trip for every entity to insert. For example, if you need to insert 10000 entities, then 10000 database round-trips will be performed and your application suffers from performances issues. Entity Framework Classic provides an extension method BulkInsert() which requires the minimum database round-trips as compared to SaveChanges(). The following example, add list of authors to the database using BulkInsert method.